Jionzen-ji Temple (慈恩禅寺) is Rinzai Zen temple located in Gujo, Gifu prefecture. This temple was established in 1606 by the castle lord, Endo Yoshitaka. He invided Priest Hanzan from Kyoto. There are graves of Endo clan in this temple. It has a beautiful Japanese Zen garden called "Tesso-en." It is very famous Koyo spot in Gujo. No photo graph and Video Camera. DO NOT take Photograph and Video tape. Admission: 300 yen for adult. 200 for under junior. The garden is designated as the scenic beautify of Gujo city. It is a beautiful Muromachi style Zen garden. There is a huge rock on the mountain side. There is a waterfalls through the rock to the pond. The sound of waterfalls plays the peaceful Zen moment. 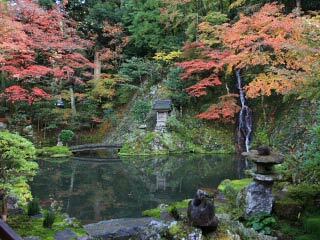 In May, it has great green leaves, and in November, it has a great Koyo, Autumn leaves.